Q. What is that 'robot voice' effect? 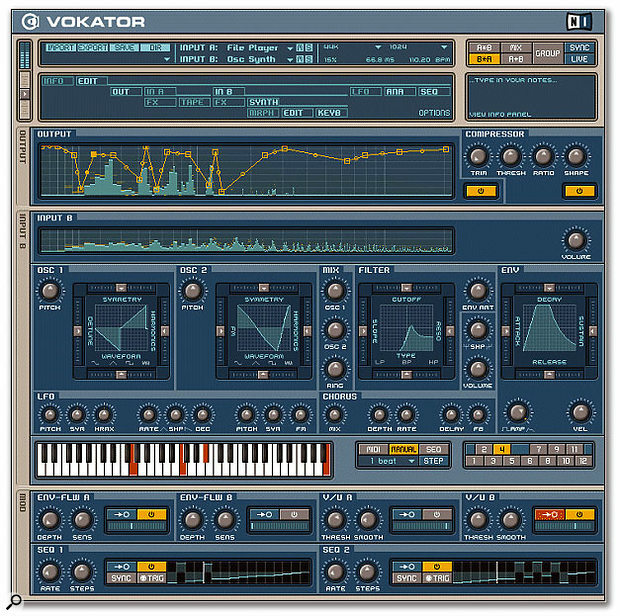 Modern software vocoders like Native Instruments' Vokator are far more sophisticated than their hardware forebears. SOS contributor Steve Howell replies: The effect is created using a device known as a vocoder, which is short for voice encoder, though it was also briefly known as a 'voder'. Like so many things in this business, the vocoder dates back many decades and, again like so many things in this business, is derived from telephonic communications technology! It was originally developed by Homer Dudley of Bell Labs in the '40s as a means to compress audio for transmission down copper telephone lines. Later, one Werner Meyer-Eppler of Bonn University saw the potential for the vocoder in the then-emerging genre of electronic music. Basically, a vocoder has two inputs: a modulator and a carrier. The modulator is usually fed by a microphone, typically with sung or spoken words, and the carrier will take a bright, sustained synth sound. Chords are played into the carrier input and words are spoken (or sung) into the modulator. The spoken/sung words are electronically imposed on the carrier signal, to create the effect of the synth speaking or singing. So how does this magic work? The carrier signal is split into different frequencies, using very tight band-pass filters (not unlike those in a graphic equaliser), and each of these has a voltage-controlled amplifier or, more recently, a digitally controlled amp. The modulator input is similarly split into different frequencies and on the output of each of the modulators' band-pass filters is an envelope follower that opens and closes the corresponding amplifier on the carrier input (see diagram). Thus, if you were to say 'ooaaah' into the modulator, the lower filters on the modulator would activate and open the lower filters on the carrier's signal; as the modulating signal moved into 'aaaah', the modulator's higher filters would be activated, in turn opening the carrier's upper filters and creating the illusion of vocals. The number of filter bands the vocoder has is crucial. In the early days of analogue vocoders, for technical reasons (and reasons of cost) they typically only had around 10 bands, making speech somewhat unintelligible. 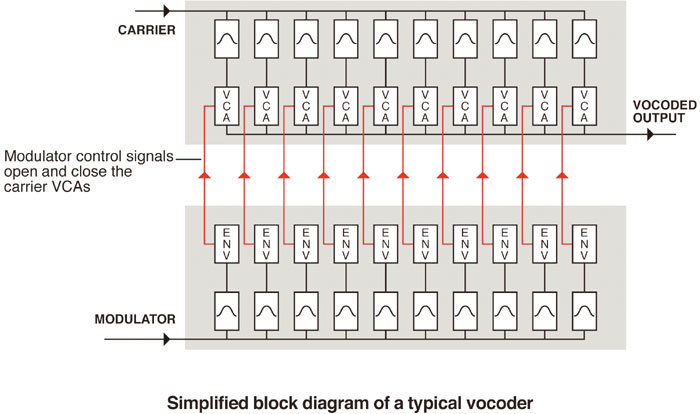 More recent developments using modern DSP allows vocoder designers to include almost any number of filters, meaning that intelligibility is greatly improved, although they still sound like vocoders. Of course, these filters only really deal with the vowel components of a sound; to cater for sibilants and fricatives, such as 's', 'b' and 'p', noise generators are sometimes used, which are triggered when the modulator detects them. While they help, they are still not convincing. Vocoders were grossly over-used to the point of cliché in the '70s ('Mr Blue Sky' being a prime example!) and they subsequently fell from grace. However, they can be responsible for some stunning sounds, and one only has to listen to Herbie Hancock's use of his Sennheiser vocoder in his brief foray into dance/disco music in the '70s and '80s to confirm this. Feeding the vocoder with an impeccably phrased Minimoog, Hancock created perfectly realistic and fluid lead vocals but with a curious robotic quality. He multitracked these to create harmonies and backing vocals to stunning effect. More recently, the vocoder has become much more than just a 'speaking synth' effect, and people routinely now feed drum loops into the modulator to rhythmically chop the carrier signal. Prominent vocoder manufacturers of old were EMS (whose products are still on sale), Moog (who I believe based their design on the vocoder Wendy Carlos contructed out of discrete modules on her giant Moog modular), Sennheiser, Korg and, of course, Roland, with their famous Vocoder Plus. More recently, there has been a veritable glut of software vocoders on the market, some free, some shareware and some payware. Notable examples are Akai's DC Vocoder and Native Instruments' Vokator, both of which offer outstanding intelligibility and flexibility.